Sure, there have been plenty of personal organizers over the past decades, but usually in the form of pocket-sized computers and the like that still require the bulk of the organizing to be handled manually by the user. The Buttle Personal Organizer takes the concept one step further. It's a fully voice-controlled, miniature appliance that can be easily carried in a pocket or used as a key-chain and that can contain 48 terabytes of personal data—so far, so good. The best part, though, is the gadget's Buttle mode. When commanded, the device unfolds to a life-size, fully-functional humanoid robotic butler who will neatly, efficiently, politely and rapidly organize any aspect of your life that you demand. Scheduling issues? Let Buttle manage your professional and social calendar for you, weeding out useless friends, business acquaintances and uninteresting engagements based on the prioritization levels you decide. Laundry problems? Buttle will launder, fold, sort, and stow with a high degree of accuracy. Romantic difficulties? Tell Buttle the name and address of the person you wish to win over or expunge from your life, and it is done. Powered solely by ambient electricity, Buttle is a perfect gift for any busy professional needing a dose of organization in his or her life, but too lazy do to it themselves. 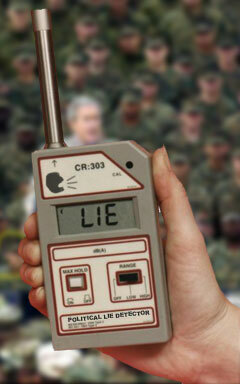 Perhaps more accurately named the Political Truth Detector, the Political Lie Detector's default readout is "Lie". This handy gadget is perfect for taking along to political rallies or speeches or when watching a speech, debate or interview on television or listening on the radio. The device automatically collects audio inflection, speech rate and verbal intonation pattern information using sophisticated audio sensors, instantly analyses them, and displays the result, "Truth" or "Lie", on a clear, easily readable LCD screen. If the politician or president happens to be telling the truth, the gadget lights up and emits a surprised-sounding "whoop-whoop-whoop" siren. With this inexpensive gadget you can instantly be alerted to those rare occasions when a politician—either intentionally or accidentally—lets something that's not a bold-faced lie slip through. A perfect Christmas gift for the politically aware in your family or circle of friends. Essentially a collapsible, mobile bubble with space for one person, the Portable Personal Biosphere is a completely soundproof, airtight, self-sufficient enclosed environment that can be used while stationary or on the go for a period up to 48 hours at a time without recharging. The convex walls can be switched from transparent to fully opaque at the voicing of a command. Oxygen, food, drink and entertainment are all fully provided and bodily functions attended to through cleverly miniaturized systems enclosed in the bubble walls. 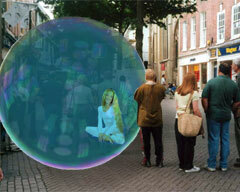 The gyrostabilized Biosphere floats a decimeter above the ground and will move with you while you walk in any direction. Packed in an easy-to-carry 50 g. pouch that slips into a pocket or purse, the Portable Personal Biosphere fully expands to its three meter diameter in less than two seconds to allow you to partially or completely separate yourself from your immediate environment and enjoy your own sounds, smells and scenery in complete privacy and security wherever you are—at home, on a hovership, in the street. A must-have gift for individuals forced to live in overcrowded and polluted environments—in other words, everyone. Bill Gates, as you may recall, was a founder and leader of the powerful Microsoft Corporation before it was absorbed by the World Wrestling Federation in 2026 in one of the more peculiar mergers of the century, and one of the wealthiest and most widely vilified manufacturers of consumer electronics and software in history. Following his death in 2059, a vacuum of sorts emerged as electronics users found themselves bereft of a channel for their personal computer consumer rage. No longer! 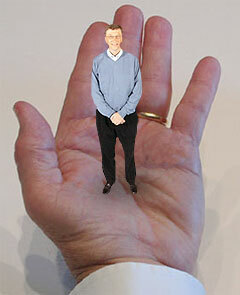 Thanks to cutting-edge recombinant DNA and reductive technologies, now everyone can own their own Tiny Bill Gates. Cloned from actual cell samples of the former magnate, each Tiny Bill Gates replica is a fully-functioning, living, miniaturized version of Bill Gates. Measuring only 10 centimeters high, the Tiny Bill Gates can be carried in a pocket or perched on the top of your life console to keep you company while you work. The Tiny Bill Gates has been "toughened up" and strengthened so as to improve durability, and equipped with a voice that is proportionally four times louder and only one third as nasal as the original. All other features and behaviors are otherwise the same, including the extra-large Tiny Geek Glasses. Each Tiny Bill Gates comes with a lifetime supply of tiny feed pellets and a little "Blue Screen of Death" that can be used for taunting. The perfect gift for older friends or family members who remember the days when computing was performed in front of a flickering screen powered by a notoriously obnoxious and unstable operating system. Later this month, we'll follow up with more nifty gadgets for professionals and home users. In the meantime, we wish you a Happy Holiday Season from Avant News.